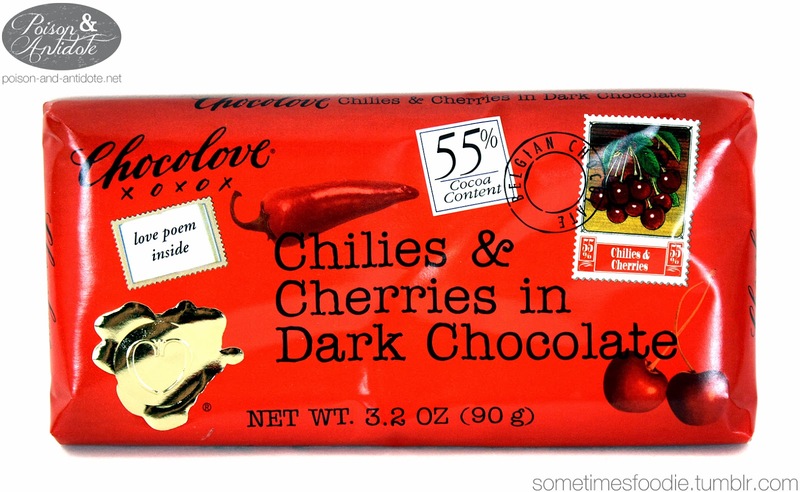 Remember that love letter themed chocolate bar I reviewed a few months back? Well I couldn't resist their packaging, and I bought another bar. Since I talked about the packaging in my other post, this will be a relatively short review that focuses on the chocolate itself. Like always, the packaging has a lot of detailing. As you can see there is a lovely foiled logo that mimics a wax seal, bold colors, and cute faux stamps that relate to the specific flavor combination inside. I absolutely love this wrapper and I wouldn't change a thing about it. This chocolate brand uses a love letter gimmick, which sounds a little cheesy, but it actually works. The packaging looks like an envelope, the back of the bar is similar to a post card, and inside you receive a short literary work (or a breif selection). Last time I received an excerpt from John Keats, and this time I got a little sonnet from William Shakespeare. (If you're dating an English major this is the candy to buy next Valentine's Day!) Time to actually try this chocolate! 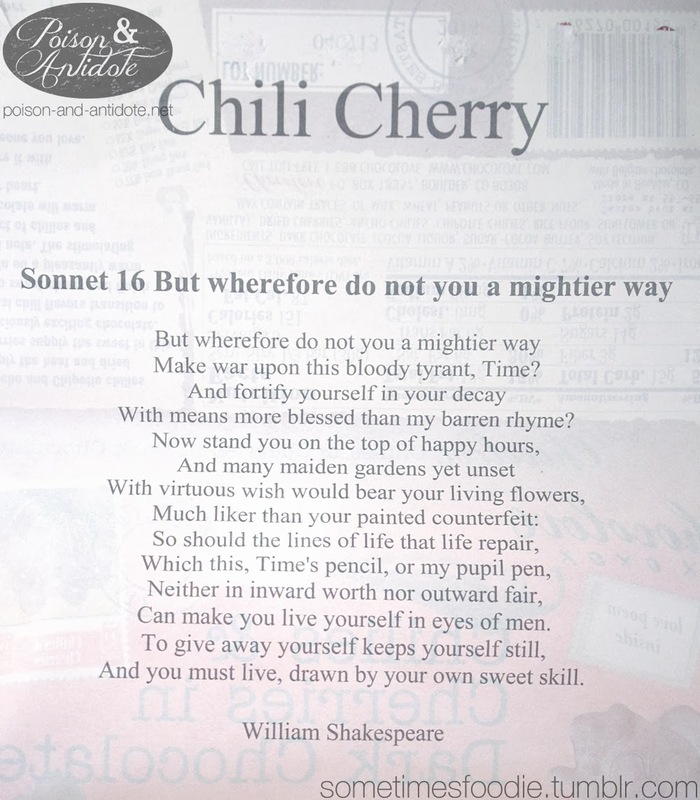 This time I opted for a more exotic flavor combination, chili peppers and cherries. Once unwrapped, the candy bar smells like dark chocolate with a hint of cracked pepper (the spice) and a little bit of red pepper flake. Taking a bite, the first thing I can taste is the dark chocolate. The chocolate quality isn't bad, it tastes similar to Dove's dark chocolate, but it's pretty waxy. (I don't think the other bar I reviewed was this waxy. Maybe that is why this one didn't melt under my lights?) This candy doesn't really melt in your mouth, but after you chew it up for a bit it'll slowly dissolve to reveal bits of dried cherries. I absolutely love cherries, and this flavor does not disappoint. 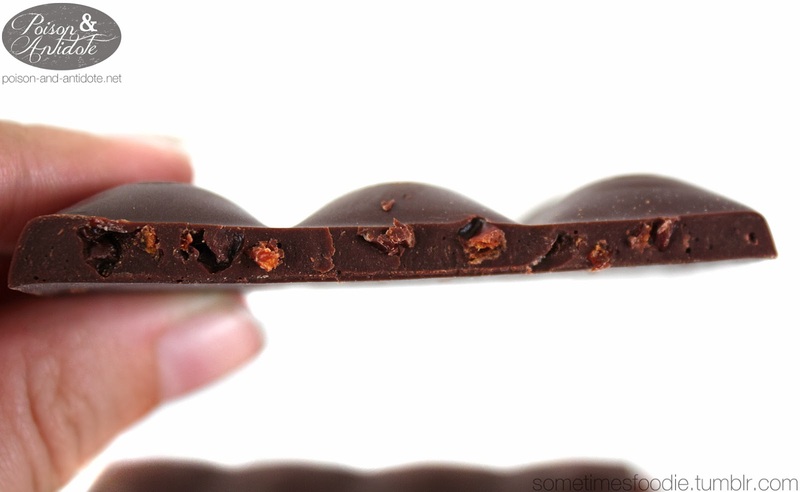 Unlike the previous Chocolove bar I reviewed, there were tons of cherry bits in each square. As for the chilies, I couldn't detect any actual chilli pieces in the candy, but there was definitely some heat. The spiciness begins to reveal itself when the chocolate melts, which takes a while, but this candy leaves a relatively decent spicy burn in your mouth that blends nicely with the other flavors. This bar wasn't life changing, but I really like combination of tangy cherries, bittersweet chocolate, and spicy chilies. This might not be a chocolate bar I crave every week, but I can see myself buying more of these in the future.